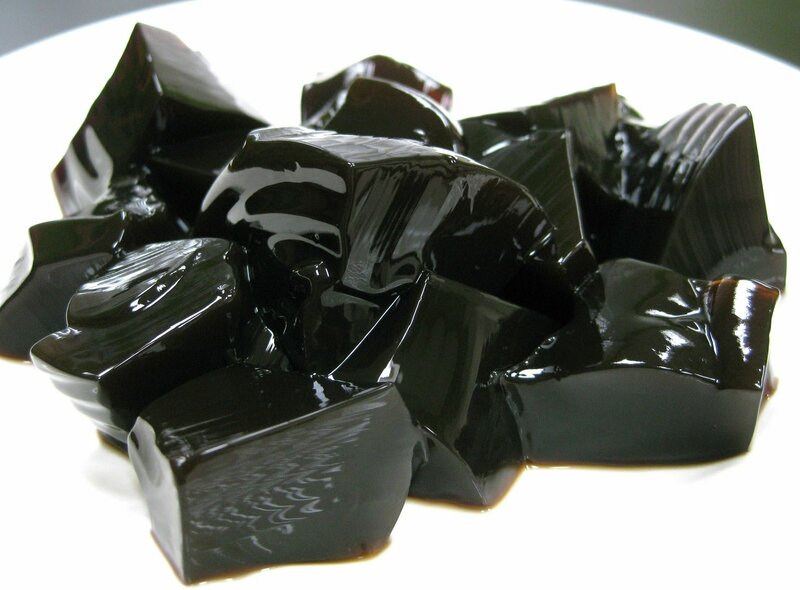 Grass jelly is a common Asian dessert. To describe it, I would liken it to a jello that has a subtle herbal taste. This makes it a great addition to any number of other desserts since it won’t overpower them. You can usually find it paired with Asian drinks like milk tea, combined with fruits and such in other desserts, or you can have a bowl of it as is with a sugar syrup or a sprinkling of sugar. The latter is my favorite way of having it. I can’t help but feel content on a hot, summer day when there’s a nice, refreshing bowl of grass jelly waiting for me to dig in. All you have to do is mix two powder packets with a cup of room-temperature water while boiling 3 cups of water in a pot. When your powder mixture has dissolved, pour the mixture in the boiling water & keep stirring the jelly until it comes to a boil again. Remove and placed in a container. Try to make sure there are no/minimal bubbles. 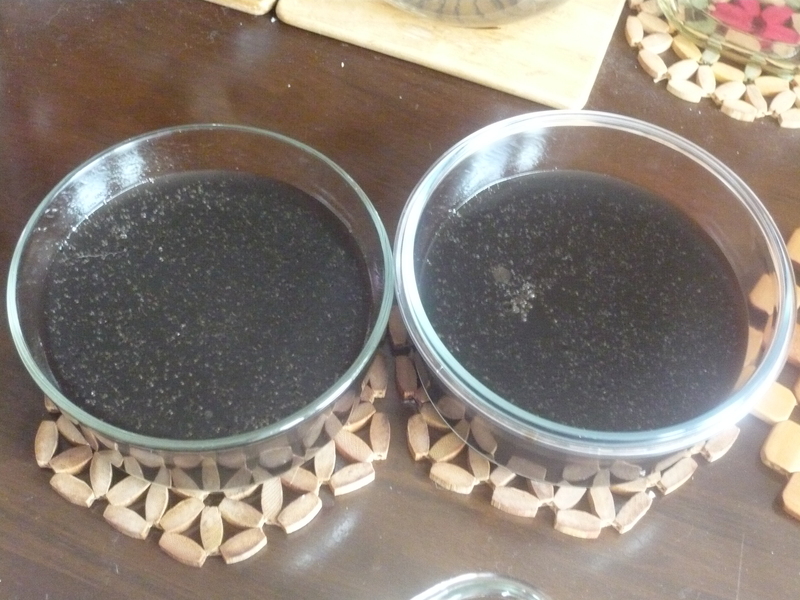 Let the grass jelly sit out and cool until about room temperature and then place in fridge to set for a couple of hours. 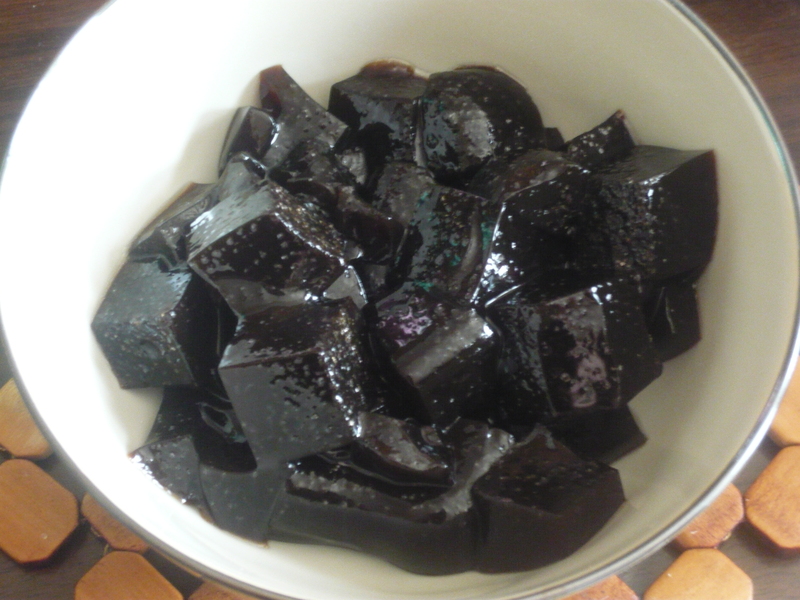 When it comes to serving, just cut the grass jelly into cubes and eat and enjoy it however you want. 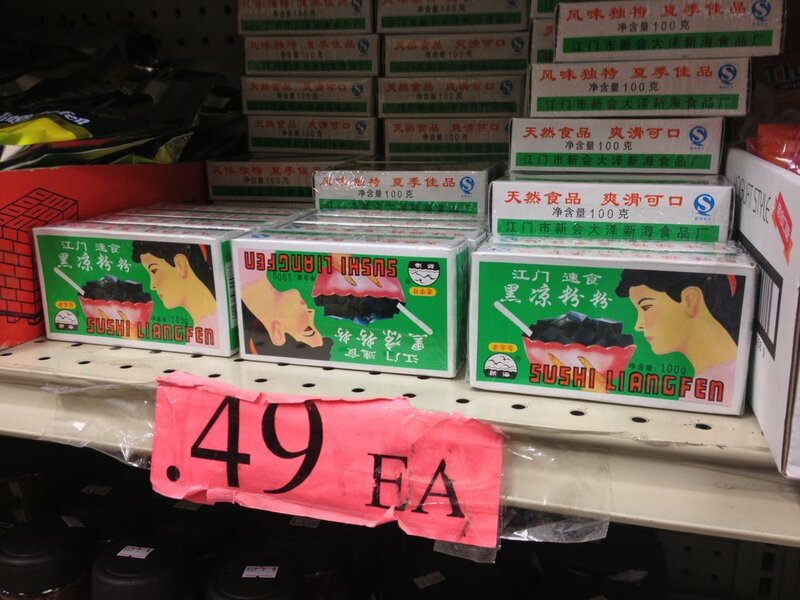 Have you ever had grass jelly before? What is your favorite way of eating it? Please let me know in the comments. Grass jelly, shredded and mixed with soy milk, is definitely one of *the* Singaporean drinks! The jelly is cut so it’ll go through a straw. It’s a great way to beat the crazy, perpetual heat here. yep, grass jelly drinks are one of my favorite ways to cool down on hot summer days. never had it with soy milk though sounds good. I’ve never heard of grass jelly before but you describe as having a herbal taste I think I know a lot of people who this would appeal to. It looks really good the way you have it with those two ice cream scoops! i know some people who don’t really like the herbal taste but it’s not too strong so if you paired it with something else like ice cream, it wouldnt overpower the ice cream so it’s great. Oh neat! 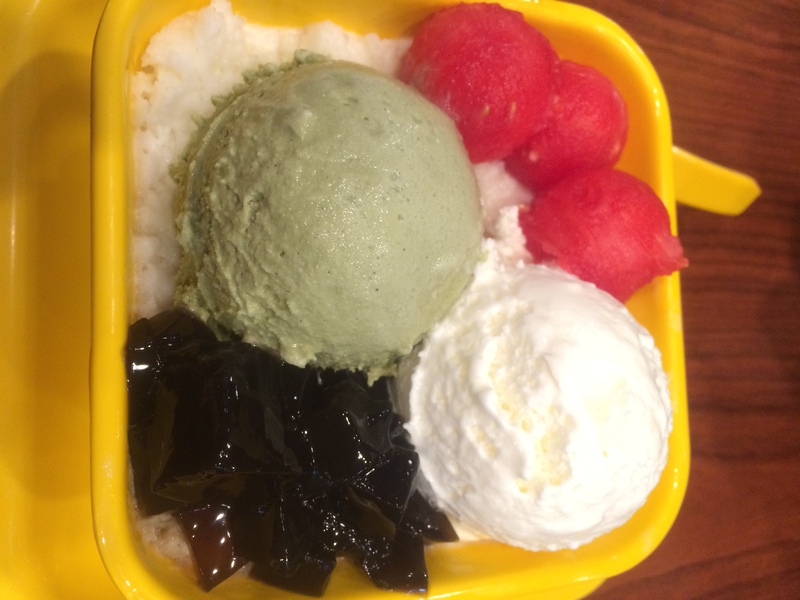 This is the first time I’ve seen a blog post on grass jelly. I keep seeing in in these drinks sold at the local grocery store, next to the bubble tea and that those types of things. I’ve definitely picked it up a couple times to inspect it before putting it back down hahaha. I’ve always been interested to try it, but I had no idea what it would taste like. Now I think I’ll give it a try!! Is it sweet at all on its own? Thank you for the instructions! I bought one of these boxes at the Asian market but it doesn’t have instructions printed in English, only Chinese (though it has Nutrition Facts in English, ha). I halved your recipe (since yours is for 2 boxes), hopefully it turns out well, I’ve enjoyed the canned version of Grass Jelly many times. Thank you!